The device could be used to deliver drugs or treat diseases. Researchers at MIT are working on tiny implantable devices that can communicate and be powered wirelessly. In the future, they could be used to deliver drugs, treat disease or monitor conditions from inside a human body. Because the devices don't require a battery, they can be pretty small and the prototype the research team has been working with is about the size of a grain of rice. But the researchers think they can get the devices to be even smaller than that. 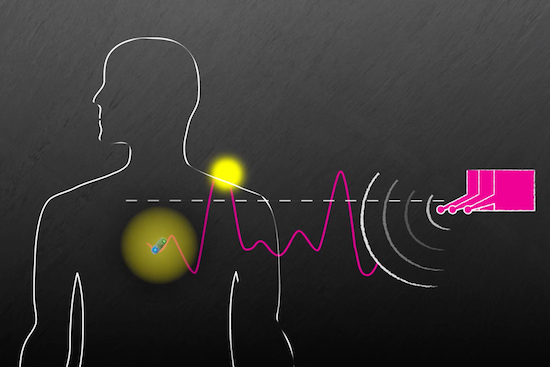 Traditionally, using radio waves to communicate with a device inside of a human body has been difficult because the waves spread out as they pass through human tissue. But the MIT researchers, working with scientists at Brigham and Women's Hospital, created a new type of antenna system that overcomes this problem and has allowed them to communicate and power their implantable devices from a significant distance. When the device was embedded 10 centimeters deep within a pig, the researchers could send power to it from up to a meter away. When the device was just under the skin's surface, it was able to be powered from as far as 38 meters away. "There's currently a tradeoff between how deep you can go and how far you can go outside the body," Fadel Adib, an assistant professor in MIT's Media Lab, said in a statement. "Even though these tiny implantable devices have no batteries, we can now communicate with them from a distance outside the body," he added. "This opens up entirely new types of medical applications." The scientists are now working to improve the system's efficiency and expand the distances from which they can communicate with the devices. Their work will be presented at the Association for Computing Machinery Special Interest Group on Data Communication annual conference in August.